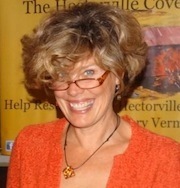 Author and Goddard College Professor Laurie Foos, whose novel The Blue Girl came out in July from Coffee House Press. This week's Write the Book Prompt was generously offered to Gary Lee Miller by his guest, Laurie Foos. It’s based on Gabriel Garcia Marquez's story, "A Very Old Man With Enormous Wings." Several pages into the story, there are several lines that are suggestive of whole stories (beyond that of the man with enormous wings). Write a story based on one of the following: a woman (or man) who since childhood has been counting his/her heartbeats and has run out of numbers; a man /women who can't sleep because the noise of the stars disturbs him/her; a sleepwalker who gets up at night to undo the things he/she has done while awake.